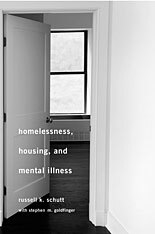 His new book (with Stephen M. Goldfinger) is Homelessness, Housing, and Mental Illness. My focus as a sociologist is on how individuals shape and are shaped by their social environment. In Loneliness: Human Nature and the Need for Social Connection, John Cacioppo (a psychologist) and William Patrick (a science writer) discuss research on the importance of the most basic element of the social environment: other people. Not content to simply highlight the importance of social ties for individual functioning, the authors link the need for social connections to our evolutionary past and to our physiological functioning and show that individual variation in sociability can shape the environment people experience. Although I have already finished Loneliness, it continues to inform my understanding of more recent books like Nudge: Improving Decisions About Health, Wealth, and Happiness. In this entertaining book, behavioral economists Richard Thaler and Cass Sunstein explain why people make the choices they do and how those choices can be shaped by “choice architecture.” As I explain in my own latest book, Homelessness, Housing and Mental Illness, the choice of many homeless mentally ill people is to reject the social connections that Cacioppo and Patrick argue are so essential to human well-being; reading Thaler and Sunstein is helping me understand how social policies can alter such self-defeating preferences while still respecting individual autonomy. In a way, this brings me to the book I am just starting to read, J. L. Heilbron’s Galileo. Galileo was one of the most respected intellectuals of late Renaissance Italy, but after his scientific observations convinced him that prevailing understanding of the universe was mistaken, he chose to use his knowledge to challenge established thinking and the preferences of his friend, the Pope. Galileo failed in this attempt during his own lifetime, but his effort ultimately changed the course of science and, thanks to Heilbron and others, continues to improve our understanding of the social context of science. Finally, Linda Gray Sexton’s memoir of surviving her mother’s suicide, Half in Love, reminds us how much we need science like that presented in Loneliness to understand this most tragic of losses. Although Anne Sexton’s poetry may have had an enduring effect on the world of literature, her suicide and the agonies that led up to it overwhelmed the social environment in which her daughter developed. Having just traced in my own memoir the origins and effects of my father’s suicide and my mother’s abandonment when I was a child, I found that Half in Love provides a compelling picture of parents’ signal importance in shaping their children’s social environment and hence their life course.